The Golden Comar Prize was created in 1997 by the insurance company Assurances Comar (Tunisie) to support literary creation, and encourage Tunisian writers, especially novelists. The 21st edition of the Golden Comar Prize was held on April 22, 2017 in the Congress Palace of Tunis (Palais des congrès de Tunis). 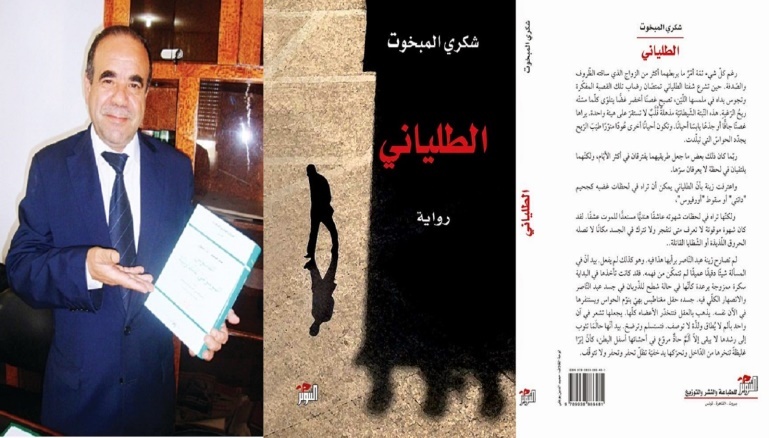 The Arabic version of the prize was awarded to Mohamed Issa El Mouadeb for his novel (Jihad Naeem) Soft Jihad. The French version of the prize was awarded jointly to Béchir Garbouj for his novel (Passe l’intrus ) May the Intruder Pass by! and Yemen Mannai for his novel (L’amas ardent) The Burning Mass. -The Jury Special Prize was awarded to Amina Zerig for her novel (Safarou El Qalb) The Heart’s Journey. -Discovery Prize was awarded to Habib Ben Mehrez for his novel (Hamden Wa-azzamen) Hamden and Time. -The Jury Special Prize was awarded jointly to Ahmed Mahfoudh for his novel (Le Chant des ruelles obscures) The Song of Dark Alleys and Gilbert Naccache for his novel (Il pleut des avions) It Rains Planes. -Discovery Prize was awarded to Jamila Ben Mustapha for her novel (Rupture(s)) Rupture(s). *L’Institut Français de Tunisie (The French Institute of Tunisia) Special Prize was awarded to Paul Zeitoun for his novel (C’était hier à Tunis: Mardochée se souvient…) It Was Yesterday in Tunis: Mordecai Remembers…. This is a new category. 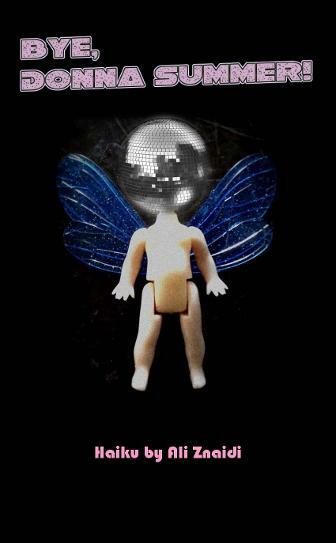 The winnng novel will be translated into Arabic. Extracts from the awarding ceremony. Video credit Tunis 24/7—A TV Programme by Elhiwar Ettounsi Channel. Around 41 novels in Arabic and 24 novels in French were shortlisted to compete for the afore-mentioned prizes. As far as the judging panel of this 21st edition is concerned, the Arabic section includes Massouda Ben Boubaker, Neziha Khlifi, Ridha Kefi, Mohamed Mahjoub, and Moncef Louhaibi and the French section includes Meriem Belkadhi, Ahlem Ghayeza, Emna Louzir, Anouar Attia, and Samir Marzouki. The 20th edition of the Golden Comar Prize was held on April 30, 2016 at the Municipal Theatre of Tunis. The Arabic version of the prize was awarded jointly to Emna Rmili for her novel (Toujane)* Toujane and Nabiha Aïssa for her novel (Maraya Al-Ghieb) Mirrors of Absence. The French version of the prize was awarded jointly to Fawzi Melah for his novel (Ya Khil Salem) Oh, Salem’s Horses! and Fawzia Zouari for her novel (Le Corps de ma Mère) My Mother’s Body. -The Jury Special Prize was awarded jointly to Mouldi Dhaou for his novel (Siratou Al-Maatouh) The Idiot’s Biography and Chedia Guesmi (or Kasmi) (Al-Massab) The Dumping Ground. -Discovery Prize was awarded to Hanene Jenane for her novel (Catharsis) Catharsis. -The Jury Special Prize was awarded to Mohamed Harmel for his novel (Les rêves perdus de Leyla) Leyla’s Aborted Dreams. -Discovery Prize was awarded to Wafa Ghorbel for her novel (Le Jasmin Noir) The Black Jasmine. Around 42 novels in Arabic and 20 novels in French were shortlisted to compete for the afore-mentioned prizes. As far as the judging panel of this 20th edition is concerned, the Arabic section includes Adel khedhr, Hayet Seyab, Olfa Youssef, Om Zine Ben Chikha, and Chokri Mabkhout and the French section includes Mohamed Mahjoub, Anouar Attia, Ahlem Ghayeza, Emna Louzir, and Samir Marzouki. 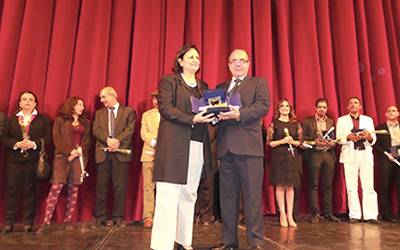 The 19th edition of the Golden Comar Prize was held on April 25, 2015 at the Municipal Theatre of Tunis. The Arabic version of the prize was awarded to Chokri Mabkhout (or Shukri al-Mabkhout) for his novel (Ettalyani) The Italian. The French version of the prize was awarded to Anouar Attia for his novel (Les Trois Grâces) The Three Graces. -The Jury Special Prize was awarded to Jamel Jlassi for his novel (Bey El Orbane) Bey El Orbane. -Discovery Prize was awarded to Nabil Gueddiche for his novel (Zahratou Oubbad Echams) The Sunflower. -The Jury Special Prize was not awarded this year. -Discovery Prize was awarded to Sami Mokaddem for his novel (Dix-Neuf) Nineteen. Around 29 novels in Arabic and 11 novels in French were shortlisted to compete for the afore-mentioned prizes. As far as the judging panel of this 19th edition is concerned, the Arabic section is presided by Hayett Saieb (a journalist) and the French section is presided by Meriem Belkhadhi (a university teacher and literary critic). Chokri Mabkhout receiving his award from Minister of Culture Latifa Lakhdar. Photo credit http://www.kapitalis.com. Extracts from the awarding ceremony taken from the website of http://hounatounes.tn. Slogans that were raised during the Arab Spring, before it has been infested by the diseased and chagrined slogans of identity of the Muslim Brotherhood, express a citizenly social awareness. Marcia Lynx Qualey was good enough to publish my translation of an interview with Tunisian and International Prize for Arabic Fiction (IPAF)-shortlisted novelist Chokri Mabkhout conducted by Abdeddayem Sallami in her awesome Arabic Literature (in English). In this interview which was originally published in Arabic, under a Creative Commons license, in the Lebanese electronic newspaper Al Modon on January 13, 2015 Tunisian novelist Chokri Mabkhout (or Shukri al-Mabkhout) talked about the craft of fiction and novel writing, the Revolution, the intellectual’s place and role in society, and politics. Dzekashu MacViban was good enough to publish my article “Creative Writing Workshops in Tunisia: A House in the Making” in his awesome magazine Bakwa Magazine (Cameroon/USA/Uganda/Germany) on February 03, 2015. Can creative writing be taught? This question poses more issues than answers. Teaching creative writing is an established tradition in the West, especially in Anglophone countries. The first MFA (Masters of Fine Arts) in creative writing was inaugurated in the United States of America in 1936 under the leadership of Wilbur Schramm. His Iowa Writers’ Workshop became a starting point if not a beacon for writing programs worldwide. The Iowa Writers’ Workshop has since its inception given writers the necessary tools to excel and achieve success both at home and internationally. First session of The House of Fiction. Photo credit The House of Fiction Facebook Page. The 18th edition of the Golden Comar Prize was held on April 20, 2014 at the Municipal Theatre of Tunis. The Arabic version of the prize was awarded to Mohamed El Bardi for his novel (Diwan El Mawajaa) The Collection of Pains. The French version of the prize was awarded to Saber Mansouri for his novel (Je suis né huit fois) I Was Born Eight Times. -The Jury Special Prize was awarded to Dr. Emna Rmili Oueslati for her novel (Al Baki) What Remains. -Discovery Prize was awarded to Fathi Jamil for his novel (Bab El Bhar) Bab El Bhar “The Door of the Sea”. -The Jury Special Prize was awarded to Khaoula Hosni for her novel (D.A.B.D.A) D.A.B.D.A. -Discovery Prize was awarded to Nejib Turki for his novel (Le destin apprivoisé) The Tamed Fate. 19 novels in Arabic and 13 novels in French were shortlisted to compete for the afore-mentioned prizes. As far as the Arabic section is concerned, the judges for this 18th edition are Hayett Saieb (a journalist), Saloua Saadaoui, (a university teacher specialized in fiction studies), Kamel Eddine Gaha (a university teacher specialized in 18th century French literature), Chokri Mabkhout (a professor specialized in Arabic literature) and Abdeljabbar Eleuch (a novelist). As far as the French section is concerned, the judges are Meriem Belkhadhi-Kaffel (a university teacher and literary critic), Ahlem Ghayaza (a university teacher), Najet Tnani (a professor), Samir Marzouki (a professor specialized in French literature) and Nabil Radhouane (a university teacher). 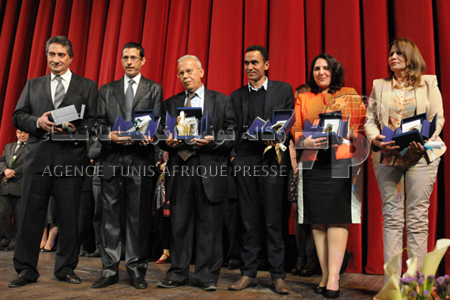 Golden Comar Awarding Ceremony 2014 Image from Agence Tunis Afrique Presse. Extracts from the awarding ceremony taken from the website of the private Tunisian radio SHEMSFM Tunisie. The Association of Tunisian Pen Opens its Activity with Defying Censorship: An Article Written by Kamel Riahi and Translated by Ali Znaidi. 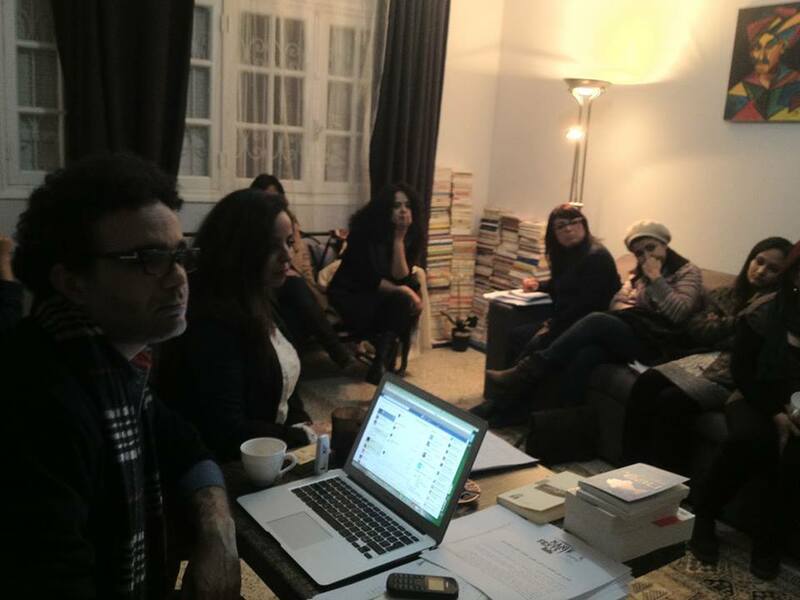 Side of the first meeting of The Association of Tunisian Pen (Al-Jazeera). In its first activity, The Association of Tunisian Pen chose to stand in the face of censoring books manifested in the so-called the legal deposit and the declaration of literary works. This came in a meeting in which it was officially announced the establishment of the association and the composition of its elected executive body headed by poet Adam Fethi. The first meeting of the association was attended by a number of creators, among them poet Adel Maizi, novelist Hedi Thabet, translator Jamel Jlassi, and philosophy researcher Adnen Jdey, and journalists and jurists, among them journalist Sihem Bensedrine who is one of the founders of the association years ago, and journalist and activist Naziha Rajiba (who is known as Om Zied). Adam Fethi: Reality has proved that the fight for freedoms is still going on (Al-Jazeera). Speaking to aljazeera.net, the head of the association, poet Adam Fethi, said that Tunisian Pen was established years ago at the initiative of a group of female and male militants of the media and culture scene who believed that defending culture is defending the human being’s humanity and who insisted on activism despite the authority’s refusal to grant them the visa, and who were keen to support creators and media persons and to be a voice of the voiceless intellectuals who yearn for freedom and independence. Fethi added that after 2011 many things have changed, but reality has soon proved to all that the fight is still going on and that the freedoms, and particularly the freedom of thought, the freedom of expression, the freedom of creativity, the freedom of media, and the free exchange of intellectual, creative and media production have not yet become a reality and they are still a newborn desirable dream which requires lots of care and vigilance to protect it from any hazard. He pointed out that the association is preparing itself for this new stage with a new executive body based on a renewed certainty that the fight for the future for all the Arab countries is mainly a cultural fight. For his part, secretary general of the association, caricaturist Tawfiq Omrane, asserted that the association abides by the Charter of International PEN which asserts that literature does not recognise borders and it must remain the common balance between all peoples, despite political turmoil. He pointed out that its members at all the time consecrate all what they have of influence to serve the understanding between peoples and their living in an atmosphere of mutual respect and they are committed to doing all they can to eradicate all hatred that is based on reasons of race, class or nationality. For his part, member of the executive body of the association, translator Jamel Jlassi, asserted that “Tunisian Pen” commits itself to defending the principle of free circulation of ideas and enjoining each of its members to do all what they can to face any constriction of freedom of expression in their country or in the group to which they belong, as well as in any place in the world. Adnen Jdey: Self-censorship is a means for intellectuals to absorb what the political sysyem wants (Al-Jazeera). At the constituent meeting of the association, writer and jurist Moez Akaichi told the story of censoring books and the story of the legal deposit and its international history and he saw that it is linked to establishing big dictatorships and totalitarian regimes to control ideas and to spy on creators and thinkers. Akaichi approached the Tunisian experience reviewing the attempts of the regimes and the rulers to control minds and to govern peoples considering them immature and unable to distinguish. Hence the leaking of an article of the constitution asserting the need for prior declaration of the content of literary works, as Akaichi said reminding of the books confiscated in the previous era as a result of this law. For his part, Adnen Jdey – who lectured about self-censorship – said that the concept of self-censorship is located between two edges; the edge of the identification between the author and the censor and the edge of the introspection of authority and practicing its mechanisms according to the confusion imposed by the ethics of expression and thought. Jdey added that self-censorship is the recourse of thinkers, researchers and writers to exercise control as a way to absorb what the political system wants and to adapt to it according to the red lines that are outlined and imposed by the religious, social and moral systems. This article appeared in aljazeera.net 29/3/2014 by Kamel Riahi. You can read the original text in Arabic here. Translated from Arabic by Ali Znaidi. Ali Znaidi’s Bye, Donna Summer! was published on March 11, 2014 by Fowlpox Press in Canada. Many thanks to editor Virgil Kay. It is in fact the first Tunisian English Language haiku collection written originally in English language. It is available as a free PDF download here. It is also available in print. 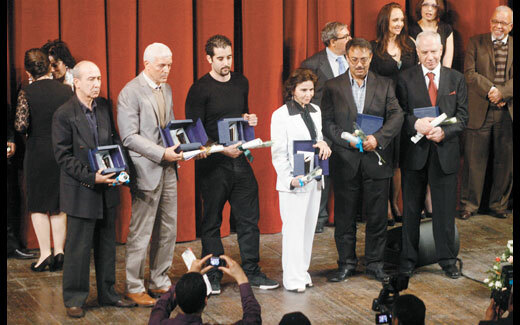 The 17th edition of the Golden Comar Prize was held on Saturday 20 April 2013 at the Municipal Theatre of Tunis. The Arabic version of the prize was not awarded as the Jury thought that there is no good work to be awarded a Golden Comar this year. -The Jury Special Prize was awarded jointly to Abdelkader Letifi for his novel (Arrihla al hintatiya) The Pilgrimage of Hentati and Hafidha Gara Biban for her novel (Al âra) Nakedness. -Discovery Prize was awarded to Abdelhamid Arraï for his novel (Fin’tidhar as’saâ’sifr) Waiting for the Zero Hour. -The Jury Special Prize was awarded to Sami Kourda for his novel (Le souffle de la bête immonde) The Foul Beast’s Breath. -Discovery Prize was awarded to Mohamed Harmel for his novel (Sculpteur de masques) The Mask Carver. 21 novels in Arabic and 11 novels in French were shortlisted to compete for the afore-mentioned prizes. Thanks to The Ofi Press Words of Kamel Riahi, Radhia Chehaibi, Saghir Oulad Ahmed & the Revolution Travel to Mexico where The Ofi Press Literary Magazine is edited. 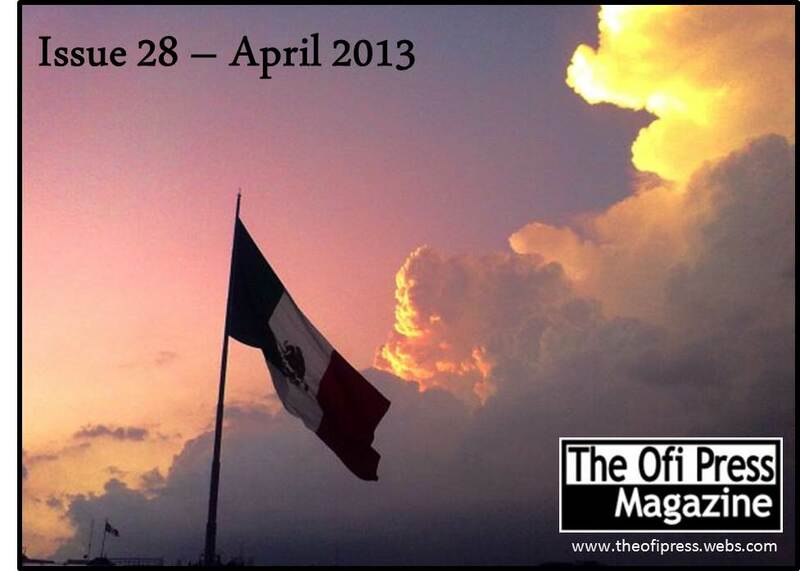 Editor Jack Little republished some of my translated works in The Ofi Press Literary Magazine (Issue 28, April 2013). By the way, The Ofi Press Literary Magazine accepts works in translation. *A book review by Mohamed Masmouli about the Tunisian Revolution. *An article by Kamel Riahi. *A poem by Radhia Chehaibi. *A poem by Saghir Oulad Ahmed.